I'm a huge fan of the work of the Wachowski siblings - I love the way they think. I had been waiting to see this film for a long time. I thought it was breathtakingly spectacular - the concept, the visual impact, the plot and the re-emergence of a Matrix-like storyline. BUT that doesn't mean this film is not without its problems. On one level the plot is quite simple but it is buried under layers of different galaxies, species, dynasties and a complex set of relationships - but helpfully everyone speaks English! There are plenty of online sites discussing the plot so I won't waste too much space here duplicating it. What is central to the story is the main character Jupiter Jones - who hates her life, is catapulted into a different life, and then decides her first life isn't so bad after all. The journey she undertakes to gain this insight takes us on a journey that lasts just over 2 hours - but the time passed quickly for me. The basic premise of the story is built on production, consumption and profit. What is produced are human beings on vast farms - like planet Earth. They are harvested to produce a distillation that rejuvenates the body and ensures longevity allowing users to remain in their physical prime even when they are in fact more than 100 millennia old! Why - because time has become the most precious commodity in the universe so the longer you live, the more time you have. Of course this is big business and with great wealth comes great power. All of this is wrapped up in DNA/genome speak and a family feud that threatens Jupiter's life and the stability of the universe. There are many moments of humour in the film. This film will be a boon for alien conspiracy theorists - and yes we even get to see how crop circles are really made! Everything about the scale of this film is huge - and that's probably where it's achilles heel lies. 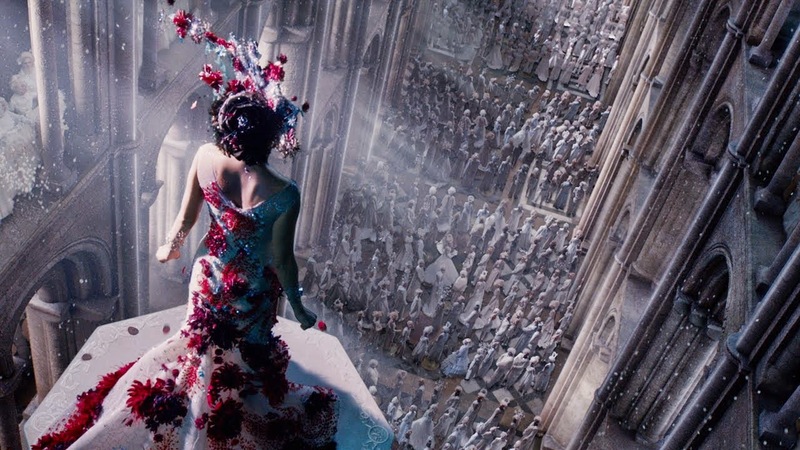 The scope of the plot, the range of kinds of characters, the myriad locations that appear and disappear, twists and turns that make it impossible to know who is on which side - and amazing Wachowski visuals which are quite simply mind-blowing. It is a huge pity that this film has done so poorly at the box office. It is obviously the first of an intended series (trilogy?) that now may never be made - or only in a small-scale way, which would be a pity for the greatest thing about this film is the huge scale of everything including the ideas. Maybe it will become a cult sleeper? I certainly hope so, but after the relative flops of Speed Racer, Cloud Atlas and now this, I hope that Hollywood will keep backing such creative originality that the Wachowski's consistently deliver. Please go and see it while it's still in cinemas (in the UK at least). I loved it and will give it 8/10 - perhaps if they hadn't tried so hard it would have got a 9 - hopefully the next one!